Our design and choice of materials focused on recognisability, transparency, daylight, functionality and orientation. The entrance doors and the fully glazed entrance hall of the hospital are accentuated by six wide concrete partitions framing seven glazed façades, each of which is three floors high. The lower three-floor structure is built from plain red brick and houses the treatment layer, the public layer and the staff layer. The technical layer on the fourth floor features an outer wall of frosted glass U sections and visually connects to the upper nursing and medical care layers, where the outer wall is made from light grey, flat aluminium panels. These project away from their supports on the front and ‘hover’ above the entrance. 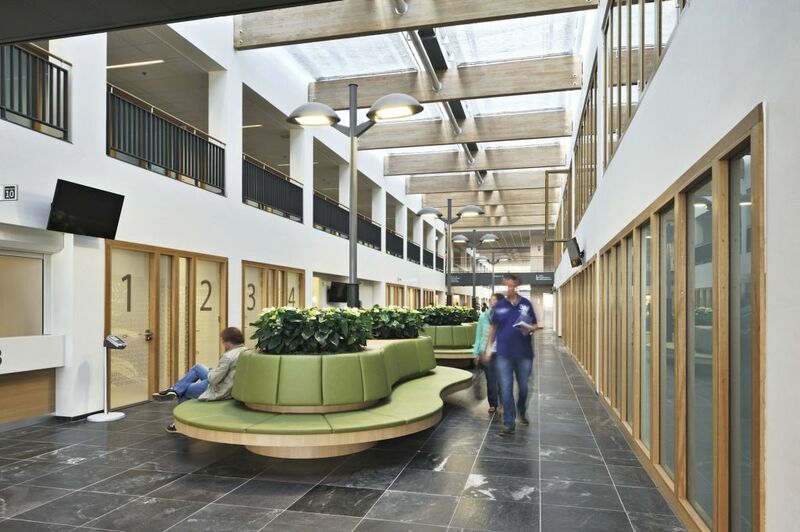 The floor plans are based on a matrix structure of modules on a grid measuring 7.2 x 7.2m, separated by daylight patios full of plants and connected by glazed corridors which also serve as brightly lit waiting rooms.